I’m so sorry for the iphone picture! I did this manicure and then uploaded this picture to my tumblr last night. I was all prepared to wear this to the movie today, but as some of you know … opaque glitter is a blessing and a curse. It is amazingly pretty and I can’t get enough of opaque glitter but it chips so easily. No matter what top coat you put on, opaque glitter only lasts about a day on me before it starts chipping. This was no exception. So I only got this one shot before the whole thing with chip-tastic and I took it off and went for a different manicure. But what I can report on for this polish after wearing it for a short time is remarkable. 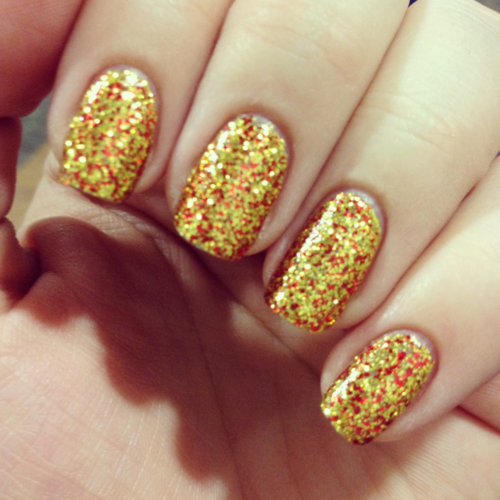 China Glaze “Electrify” is a densely packed gold and red glitter. They aren’t exactly that “micro” to consider them micro-glitter, but they are small. They are medium-small round glitters that seem to be about 60% gold and 40% red. The result? It looked like my nails were on fire! If you squinted, it looked like an orangy gold color that glistened in every single possible light. I loved this polish and I tweeted a picture of it and China Glaze Retweeted it! So I had a ton of people asking about the application. One girl said it reminded her of Gryffindor from Harry Potter (which it totally does!). The application, 2 coats and it was opaque. It does chip really easily and another trouble you run into with this polish is that the application is a little messy and the brush gets all goopy from the thick glitter. I love this polish and it will be awesome in the summer and a really cool accent nail with any red, yellow or orange polish. ← Zoya Beach and Surf Summer Collection Preview! its really pretty and i know if you can’t find that glitter, nicole by opi makes one similar except with a little less red. both are good tho! Thanks! Luxe and Lush was definitely one of the better ones.